More than any rock artist since The Beatles, Radiohead's music inhabits the sweet spot between two extremes: on the one hand, music that is wholly conventional and conforms to all expectations of established rock styles, and, on the other hand, music so radically experimental that it thwarts any learned notions. While averting mainstream trends but still achieving a significant level of success in both US and UK charts, Radiohead's music includes many surprises and subverted expectations, yet remains accessible within a framework of music traditions. 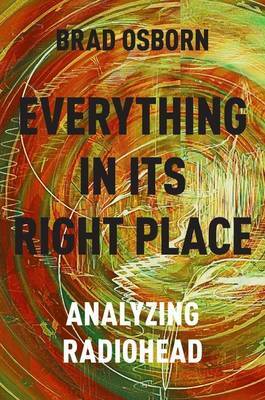 In Everything in its Right Place: Analyzing Radiohead, Brad Osborn reveals the functioning of this reconciliation of extremes in various aspects of Radiohead's music, analyzing the unexpected shifts in song structure, the deformation of standard 4/4 backbeats, the digital manipulation of familiar rock 'n' roll instrumentation, and the expected resolutions of traditional cadence structures. Expanding on recent work in musical perception, focusing particularly on form, rhythm and meter, timbre, and harmony, Everything in its Right Place treats Radiohead's recordings as rich sonic ecosystems in which a listener participates in an individual search for meaning, bringing along expectations learned from popular music, classical music, or even Radiohead's own compositional idiolect. Radiohead's violations of these subjective expectation-realization chains prompt the listener to search more deeply for meaning within corresponding lyrics, biographical details of the band, or intertextual relationships with music, literature, or film.Synthesizing insights from a range of new methodologies in the theory of pop and rock, and specifically designed for integration into music theory courses for upper level undergraduates, Everything in its Right Place is sure to find wide readership among scholars and students, as well as avid listeners who seek a deeper understanding of Radiohead's distinctive juxtapositional style.